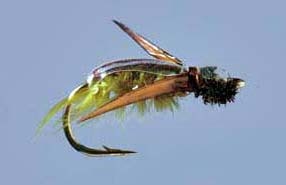 Water Boatmen -- Eaten by trout and other freshwater fish; fly fishermen try to imitate insects by using artificial "flies." There is probably no bug that incites smiles in everyone lucky enough to behold it going about its daily business like the water boatman. 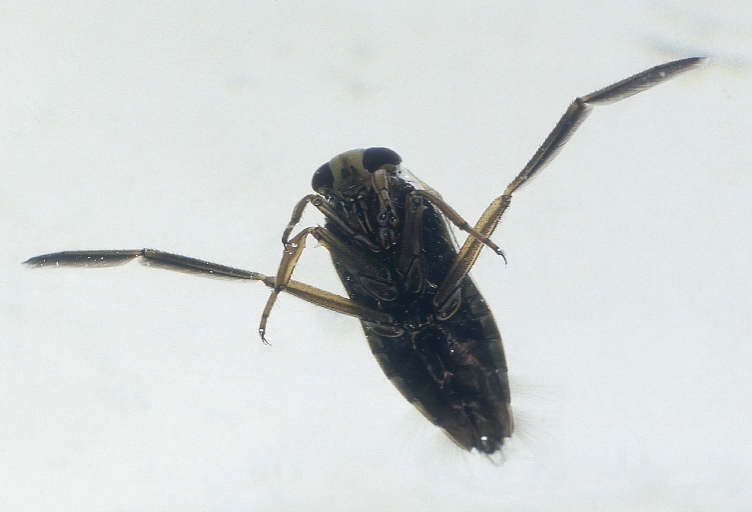 The water boatman earned its name because of its rather unique swimming practices. It is a cousin of the backswimmer, but they can easily be told apart simply by watching how they move. The water boatman swims underwater, using its large hind legs to propel itself at high speeds, as though it was in a row boat under water. The backswimmer, on the other hand likes to swim upside down, on its back on top of the water. 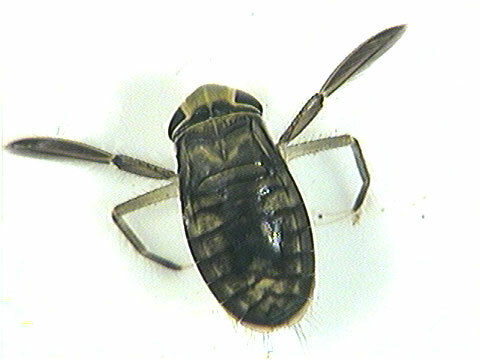 The water boatman is part of the Corixidae family of insects. These little guys have a long, flat body which reaches up to 13 mm in length. They have large wings folded across the back of their bodies with fine striations. The water boatman is built for submarining under water, where they eat plants and algae by injecting bits of plant tissue with saliva which breaks it down into a nutritious mush which is then sucked up by the water boatman. In comparison to other aquatic insects, the water boatman is relatively strange because he is a vegetarian, and only a few species of water boatmen eat other small creatures. If you get water boatmen and/or backswimmers in your swimming pools there are several options to rid yourself of them; shock the pool and use a product such as Corian Bug-Away; get BioGuard brand Back-Up algaecide and put the whole bottle in your pool; or the natural method -- turn on your pool light and wait until they swim towards it (they will), then scoop them up with a net. The water boatman has a distinctive appearance and can be told apart from its cousin the backswimmer both by its appearance and actions. 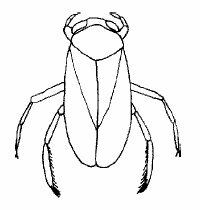 The water boatman has 2 fore legs which are short and made for crawling, while the four hind legs are long and covered in hair. The hind legs are essentially converted into long oars that are built for swimming, hence the water boatman's name. 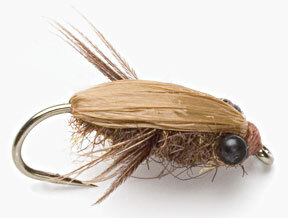 The water boatman is not only a delicacy amongst fish, but humans as well. In parts of Mexico, water boatmen are consumed in large amounts where they are considered a delicacy. 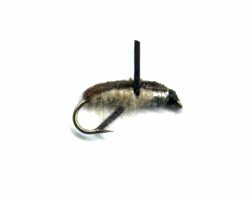 Flies modeled after the water boatman will typically resemble the back swimmer, with a long flat body and appendages hanging out the sides. Grab a few real or fake ones today and get angling!